Posted on Tue, Feb 28, 2012 : 5:59 a.m.
INDIANAPOLIS -- Mike Martin arrived at the NFL Scouting Combine hoping to shake up the perception he isn’t athletic enough to be an early-round draft pick. He had no idea it’d be his hotel doing the shaking. “The hotel we stayed at, there was a freight train that rolled right by it -- like, a freight train,” the former Michigan defensive tackle said in an interview Monday. “Like, in the middle of the night, every hour-and-a-half, a train would go through and shake the whole hotel. It was just another hardship during a weekend of hardships for the participants. They had 4 a.m. drug tests after late-night team interviews, for example. They weren't given complete schedules, keeping them on their toes. And so on. It's designed to help sort the top prospects from the riffraff, and Martin responded spectacularly well. He came to the combine touting his bench press, but it was his overall performance in the field drills Monday that will leave the greatest impression. He finished among the top four defensive tackles in every event, a display of power and speed. 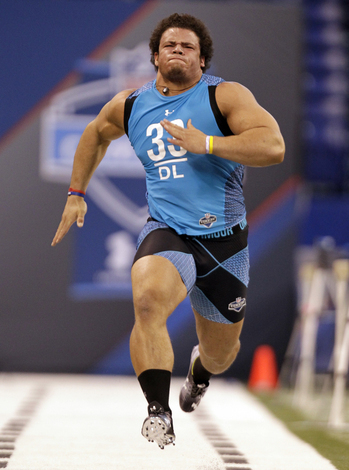 Former Michigan football player Mike Martin runs the 40-yard dash at the NFL scouting combine in Indianapolis on Monday. He finished in 4.88 seconds, third-best among defensive tackles. "The scrutiny and the pressure and everything that goes into the combine, and it all comes down to one day," Martin said. "It’s all a mental grind, and the last day, physically, you just got to be on top of your game. "The feedback from coaches was very positive, and that’s all I can really ask for. ... I did a really good job of boosting my draft stock today and put myself in a really good position going into the draft." Martin entered the weekend ranked the No. 13 tackle by ESPN and No. 10 by CBS. He remains slightly undersized at 6-foot-1, 306 pounds, but likely will get a bump in the rankings after his combine performance. 40-yard dash: 4.88 seconds, third among defensive tackles. Three-cone: 7.19 seconds, third among defensive tackles. 20-yard shuttle: 4.25 seconds, second among defensive tackles. Broad jump: 113.0 inches, first among defensive tackles. Martin said he poured more of his preparation into those drills as the combine drew near. "My goal was to come down here and show my athleticism, and how smooth I transition getting out of the hole and making cuts," he said. "My strength wasn’t really something I was trying to showcase, because everyone already knows I’m strong. "But there was a question mark on how athletic I was, and I think I definitely (answered) that." As Martin channeled his combine prep into the speed drills, he backed off slightly on the bench press. That helps to explain why he posted only 36 reps, well short of his goal of 50. Of course, "only" is a relative term here. Martin fell 13 reps short, but still finished second in his position group. Memphis' Dontari Poe had 44. "It wasn’t what I wanted to do, but I wasn’t necessarily disappointed by it either," he said. "I was more worried about doing all the drills and showing my athleticism. I knew I was going to get a good amount of reps on the bench." Martin said because he did so well in Indianapolis, he does not expect to run or lift at Michigan's pro day March 15. He said he probably will do only positional drills with coaches. For now, he will return to his Novi apartment and resume workouts at BarwisMethods, although his regimen will transition into more football-specific work. He'll also be rubbing shoulders with a pair of NFL defensive linemen, LaMarr Woodley and Brandon Graham. Both are former Michigan stars. Martin hopes to join them as the Wolverines' next NFL defensive lineman. And now, he's one step closer. Wed, Feb 29, 2012 : 5:27 p.m.
Mike Martin is a coaches dream; determined, hard working,coachable, with a 'never give up' attitude. I'd hate to be in his path. Good Luck Mike!! GO BLUE!! Wed, Feb 29, 2012 : 5:06 p.m.
Once he gets in the pro's he will be a 250 lb. Outside linebacker. They test for steroids. Wed, Feb 29, 2012 : 9:47 p.m.
All the things Ive read state that steroids stay in your system way longer than 30 days. We should contact Vernon Gholston for confirmation though. Wed, Feb 29, 2012 : 8:56 p.m. It's not marijuana Ted. It doesn't stay in your system for 30 days. The method used is called cycling. Wed, Feb 29, 2012 : 7:50 p.m.
&quot;They had 4 a.m. drug tests after late-night team interviews, for example. They weren't given complete schedules, keeping them on their toes. And so on.&quot; You must not have read the article so I'll help ya out rightmind250. Tue, Feb 28, 2012 : 9:44 p.m.
Was watching it a bit on NFL Network yesterday. Martin looked great...big and fast, but still very cut. Warren Sapp said that Martin &quot;looked like a fullback&quot; out there doing the drills. Tue, Feb 28, 2012 : 7:45 p.m.
Tue, Feb 28, 2012 : 7:10 p.m.
My gosh-those are some muscles!! He should sign immediately with underarmour as an advertisement. Tue, Feb 28, 2012 : 6:09 p.m.
That picture... I'm not sure whether I'd be more terrified of Mike Martin or an actual truck about to run me over. Tue, Feb 28, 2012 : 5:10 p.m.
Like several pros from UM in the NFL, being the fact he played for quality coaches and a # 1 ranked program the scouts know his football pedigree. Tue, Feb 28, 2012 : 4:18 p.m.
Tue, Feb 28, 2012 : 3:40 p.m.
Tue, Feb 28, 2012 : 2:51 p.m.
Good Luck Mike, All your hard work will pay off in the end. Tue, Feb 28, 2012 : 1:57 p.m.
Good luck to Mike. He was a beast at Michigan and I hope he succeeds in the pros. Tue, Feb 28, 2012 : 1:13 p.m. I don't think the 300 pound Walmart shoppers are going to be benching 225 lbs once, much less 30some times. Martin is 306 with 12% body fat. The dude is ripped! Tue, Feb 28, 2012 : 1:12 p.m.
Tue, Feb 28, 2012 : 12:35 p.m. It's funny, you can go to the mall or Wal Mart and find many guys 300+ pounds. 300 is the new 200. Tue, Feb 28, 2012 : 3:46 p.m.
400+ guys at Walmart. They are having to change the seats in schools because kids don't fit into them anymore. Tue, Feb 28, 2012 : 12:31 p.m.
&quot;Slightly undersized at 6-1, at 306 pds&quot;, I'd hate to see the grocery bill.